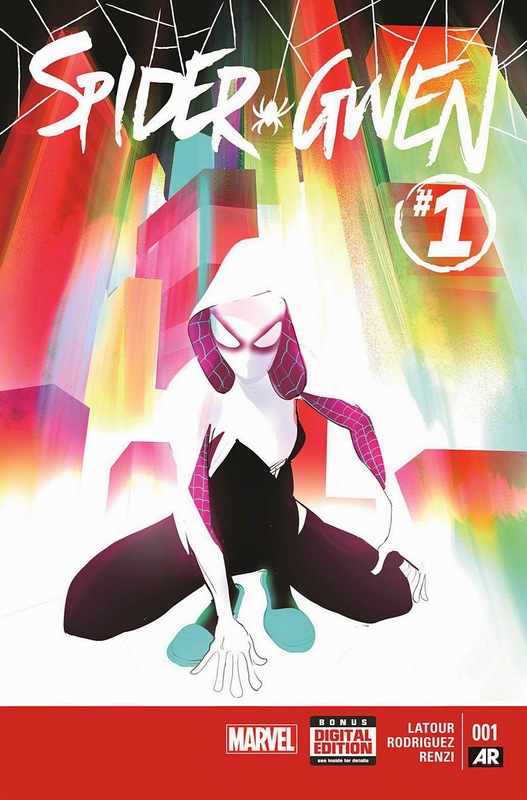 The highly anticipated debut of Spider Gwen's very own title has finally arrived! People everywhere were climbing over each other in frenzied panic to get their copy with their coveted variant cover. Okay... no one was really doing that..But people were really excited!!! Last month I conducted an interview with Jason Latour on the series. I poked my nose into Marvel's announcement of Secret Wars and got to ask him lots of nosy questions about the series. Now it's finally here and I got to read it straight away! First let me point out what I love about the book besides Gwen's awesome outfit which is pretty much all the rage in the cosplay world right now. I love that Gwen was in a band and got kicked out by her egotistical leader Mary Jane. This happened to me in my early twenties. I started a band with another girl and after we gained some slight popularity, basically I had to go. I was kicked out. Then the band literally disappeared. Hope that happens to Mary Jane. Did I ever tell you how much I disliked her as a child? She was my least favorite character in Spiderman and I actually preferred the blond, rich Gwen Stacy to her. Perhaps that's why I am also so in love with House of M. You know, besides the fact that it is awesome, Peter actually marries Gwen in the alternate reality made by the Scarlet Witch. To this day, I think it is one of TWO crossover collections I own in trade format from the Marvel universe. In this universe Mary Jane is just as egotistical and self centered as I had always imagined her to be. She's just less subtle about it but it's not really MJ's fault. I mean, she's been written into Spiderman by men since conception and mostly served as a plot device to constantly make things more complex for Peter Parker. I liked her better before she ever dated him. This all being said, I'm liking Spider Gwen. We get to hear her inner monologue which is much less self deprecating than Parker's conscious and she gets some witty come-backs and one liners in there when she runs into The Vulture. The Vulture by the way looks badass. All the artwork is really quite stunning. Robbie Rodriguez is the seriously owning this and I'm hoping they don't trade him out in five issues like so many other awesome Marvel titles that went south *cough Savage Wolverine cough*. At any rate, I can't wait for more. :D Go get yours now! I command it with my floppy green fist!